So a little disclaimer to start this post... I really do try to stay positive around here, but if I were to report just the highlights of the week this week I would be kidding myself. Minimal high-fiving this week, sorry, folks! This week has stunk, and it all started at 4:30 last Friday the 13th with house news. I could go into lots of detail, but that would probably bore you, but it is truly up in the air about what was going to happen with the house we are hoping to buy, and it has drug out: all weekend...waiting... Monday... waiting... Tuesday... more waiting... Wednesday... more waiting... and honestly as I finish this up Thursday night, we are still waiting. The cruddy thing is, it's nothing we can control. It's nothing we have done. It's not our finances. So, we wait. This week was conferences... 7:30-7:30 at school Monday and Thursday... and conferences during early out Wednesday... and conferences all day today... It's not even that I really dislike conferences, I just miss the time with my babies. It was just a long, not fun, tiring, stressful week. I don't write this for sympathy. I just write it to let you know life isn't all sunshine and rainbows around here, and I don't want to hide that from you. I made my first Jamberry sales goal the company set for the month, and also had some new customers pop up allowing me to be on my way to meeting the second sales goal. Again, I don't want to be all Jamberry, Jamberry, Jamberry, but this opportunity has been a way we've been able to buy some things for the new house <----ha... (I laugh and almost cry as I type that) without digging too deeply into our already slim budget. And I get to have pretty nails! Henry tried out a wrestling practice for little ones at the local high school. Russ took him, but reported that Henry had a blast, and he'd never seen him smile quite so big. He was totally into it for an hour and a half, which is a long time for a 5-year-old. We're at the age where we are just testing out the waters of different activities, but it's fun to see him have a good time. He was so excited to tell me all about it when he got home. TOMS are on Zulily this week, which means I can feed my obsession for a little less money. I picked up these pair of booties thanks to some birthday money, and I can't wait to wear them. 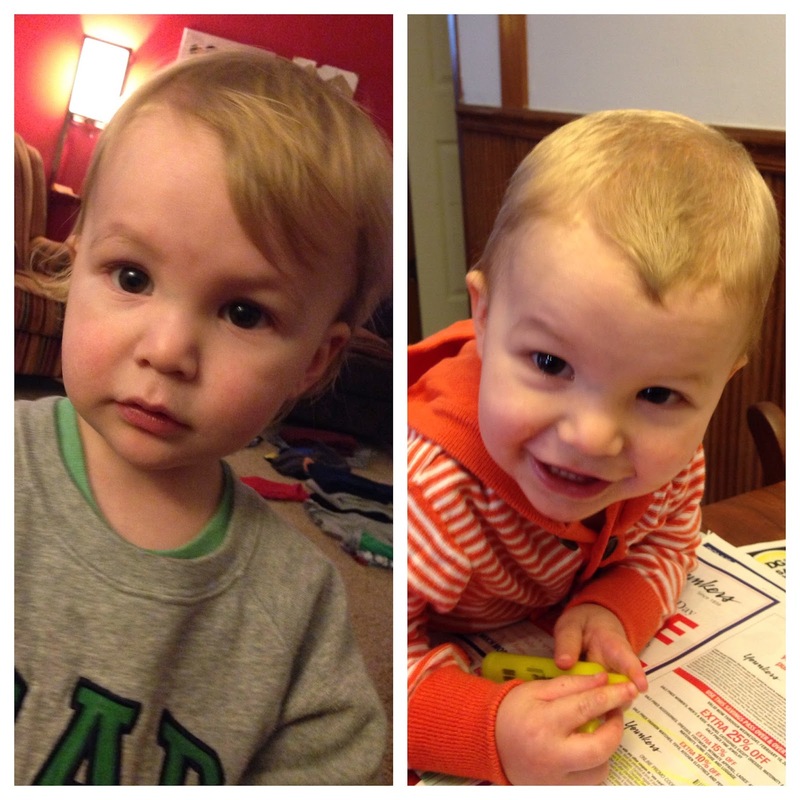 We gave Wesley a buzz cut, and he did extremely well. I think he looks so different! So, a cute kid picture to end the post that started on some bummer notes. Thanks for making your way through it all. Hopefully I'll have some better house news to give you next week... or I'll be throwing the address stamp I already ordered for the place in the trash... oops.